"A city of Faith & Beauty"
Kirtland is a city in Lake County, Ohio, United States. The population was 6,859 at the 2010 census. Kirtland is known for being the early headquarters of the Latter Day Saint movement from 1831–1837 and is the site of the first Mormon temple, the Kirtland Temple, completed in 1836. The city is also the location for many parks in the Lake Metroparks system, as well as the Holden Arboretum. From 1831 to 1838 Kirtland was the headquarters for the Latter Day Saint movement. 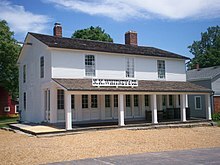 Joseph Smith moved the church to Kirtland in 1831, shortly after its formal organization in April 1830 in Palmyra, New York. Latter Day Saints built their first temple there, a historic landmark that is now owned and operated by Community of Christ, one of the main Latter Day Saint movement groups. The temple was built with a degree of opulence, considering the underdeveloped nature of the area and the poverty of most early church members. Many attending the Kirtland Temple dedication in 1836 claimed to see multiple heavenly visions and appearances of heavenly beings, including deity. For this and other reasons, Kirtland remains a place of importance to those of all Latter Day Saint denominations. Many sections from the Doctrine and Covenants, considered modern revelations and canonical by most denominations within the Latter Day Saint movement, originated in Kirtland during the 1830s. Ownership of the Kirtland Temple came into question after the main body of Latter Day Saints moved west. The Reorganized Church of Jesus Christ of Latter Day Saints (now Community of Christ) sought to have the matter settled in civil court; but ultimately obtained ownership of the property by virtue of Adverse Possession. [better source needed] Today, besides giving tours, the Community of Christ allows others to use the temple for special meetings. Kirtland saw few changes until after World War II when several residential subdivisions were built. In 1957 a high school was built and in 1961, Gildersleeve Elementary was built along Chardon Rd. (US 6). In 1968 a middle school was completed for grades 6–8. The site of the murders was converted from a privately owned home into a church beginning in 2007. New Promise Church opened in April 2009. In the 1990s, as Kirtland became an increasingly popular tourist destination, Historic Kirtland Village was created in the Kirtland flats along the East Branch of the Chagrin River. The buildings in this area preserve or replicate structures that were present in the 1830s. Historic Kirtland structures, many of which are related to early Mormon history, include the NK Whitney home (original structure), Newel K. Whitney Store (original structure), a sawmill (replica), an ashery, the Sidney Rigdon home (original structure), and the John Johnson Inn. This area provides insight into what life was like during the period when Kirtland was the home of Joseph Smith, Brigham Young, and other founders of Mormonism. Community of Christ and The Church of Jesus Christ of Latter-day Saints (LDS Church) both operate visitor centers and give tours of the buildings and sites which they own. A group of volunteers puts on an annual musical theater production celebrating the city's Latter Day Saint history called "This Is Kirtland! ", which is held at the nearby LDS meetinghouse. Kirtland has been visited by two sitting Presidents of the United States, including George W. Bush. Kirtland is located at 41°36′9″N 81°20′41″W﻿ / ﻿41.60250°N 81.34472°W﻿ / 41.60250; -81.34472 (41.602581, -81.344706). Kirtland is located south of the lake shore plain of Lake Erie and is situated on the higher elevations of the Allegheny Plateau. The principal geographic features are the East Branch of the Chagrin River, Pierson's Knob, and Gildersleeve Mountain, 1,163 feet (354 m) Daniel's Mountain,1,246 feet (380 m) is the high point. Kirtland is primarily a residential community. Over 20 percent of the land area is forest preserve or park land. The Holden Arboretum at 3,500 acres (14 km2) is the largest of these, but not all of Holden's land is located in Kirtland. Three metropolitan parks are also in Kirtland. The largest is Chapin State Forest, at 390 acres (1.6 km2), which includes much of Gildersleeve mountain. Also in Kirtland are Penitentiary Glen, and the Lake Farm Park. Lakeland Community College is located largely in the City of Kirtland, the campus dominating the northern part of the city. As of the 2010 Census, there were 6,859 people, 2,544 households, and 1,948 families residing in the city. The population density was 411.9 inhabitants per square mile (159.0/km2). There were 2,716 housing units at an average density of 162.9 per square mile (62.9/km2). The racial makeup of the city was 97.7% White, 0.1% Italian, 0.4% African American, 0.1% Native American, 0.7% Asian, 0.2% from other races, and 0.9% from two or more races. Hispanic or Latino of any race were 1.1% of the population. At the 2000 Census, there were 6,670 people, 2,445 households, and 1,885 families residing in the city. The population density was 401.8 people per square mile (155.1/km2). There were 2,558 housing units at an average density of 154.1 per square mile (59.5/km2). The racial makeup of the city was 98.47% White, 0.27% African American, 0.15% Native American, 0.39% Asian, 0.03% Pacific Islander, 0.03% from other races, and 0.66% from two or more races. Hispanic or Latino of any race were 0.55% of the population. 18.5% were of German, 14.3% Italian, 12.0% Irish, 9.6% English and 6.2% Slovene ancestry according to Census 2000. In the city the population was spread out with 23.7% under the age of 18, 6.2% from 18 to 24, 24.6% from 25 to 44, 30.7% from 45 to 64, and 14.8% who were 65 years of age or older. The median age was 42 years. For every 100 females, there were 97.5 males. For every 100 females age 18 and over, there were 95.1 males. ^ "Douglas E. Davidson, candidate for Kirtland mayor, November 2015 election". The News-Herald. 27 October 2015. Retrieved 31 January 2016. ^ "Kirtland Mayor Doug Davidson". Kirkland, Ohio. Retrieved 31 January 2016. ^ a b "RootsWeb.com Home Page". ftp.rootsweb.com. Retrieved 6 April 2018. ^ "Historic Kirtland Visitors' Center". The Church of Jesus Christ of the Latter-day Saints. Retrieved 24 August 2017. ^ Scott, Betsy (November 14, 2007). "Site of cult murders demolished". The News-Herald. Retrieved September 3, 2017. ^ "Our Story - New Promise Church - Kirtland, OH". newpromisechurch.com. Retrieved 6 April 2018. ^ "This is Kirtland Musical". thisiskirtland.com. Retrieved 6 April 2018. ^ "Bush pitches reform in a relaxed setting". The News-Herald. April 18, 2005. Retrieved September 3, 2017. ^ Hutchison, John Arthur (August 3, 2006). "Bush visits Lake". The News-Herald. Retrieved September 3, 2017. ^ "Ohio State University website" (PDF). osu.edu. Retrieved 6 April 2018. ^ "Lake County Ohio Parks". Lake Metroparks. Retrieved 6 April 2018. ^ "Data Center Results". www.mla.org. Retrieved 6 April 2018. This page was last edited on 10 April 2019, at 16:00 (UTC).